**Also contains Vitamins E, K, B1, B2, B6, PP, minerals, flavonoids, carotenoids, organic acids and other mineral substances. 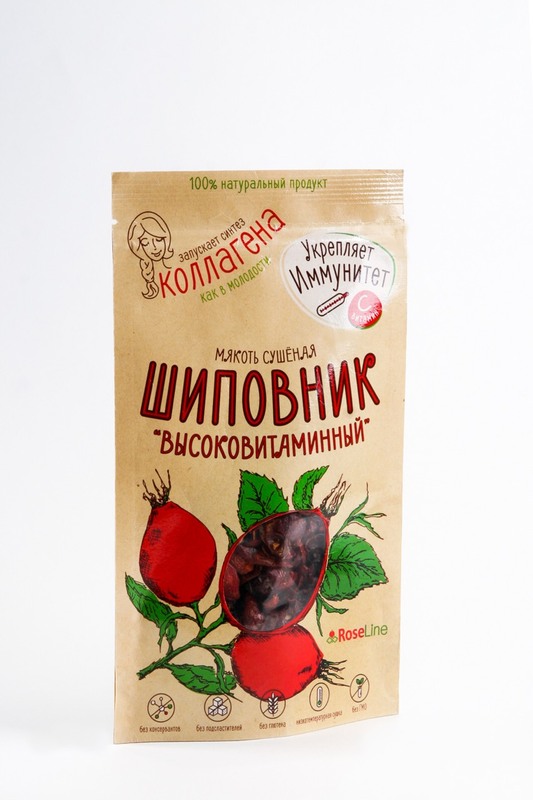 There is an unique product in front of you – varietal rosehip – which is the result of the selection work of USSR Scientific Research Institutes, which we have continued at the present time. A special feature of our product is the phenomenally high content of vitamin C – 7.2% of the mass. This is the third indicator in the world of all products known to mankind: after the berries of kamu-kamu and ziziphus. Vitamin C is the most important vitamin for people and enters the body only with food. Natural vitamin C is fully absorbed in the organism. We can distinguish three most important functions of our body, the work of which is not possible without vitamin C: immune, hematopoietic, and ATTENTION! – collagen synthesis. It should be noted that collagen, contrary to the advertised medications, can not be “implanted” into the body from outside. Like any foreign protein, it will be decomposed by the human organism. 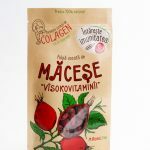 But at a sufficiently high level of vitamin C and iron, and these two components are contained in our rosehip, collagen begins to be developed again, as in youth. 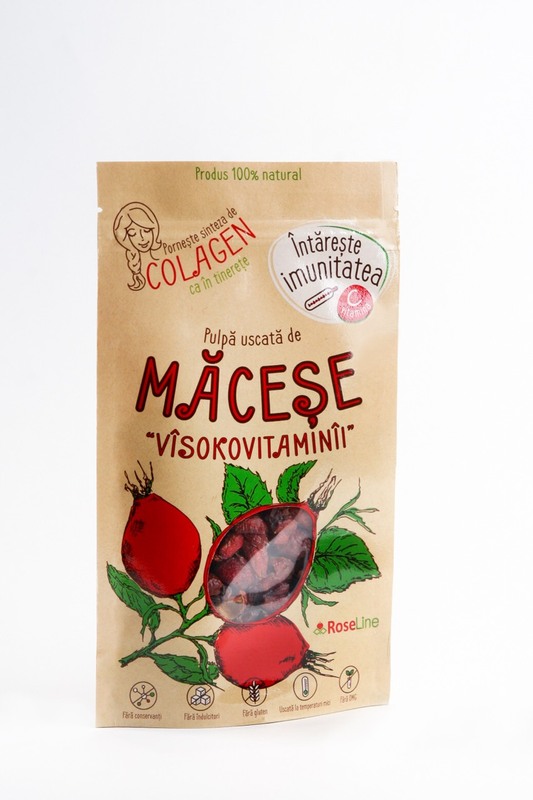 The daily requirement for vitamin C will be filled with only one teaspoon of our rosehip. 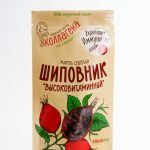 Being to mention also that the rosehip pulp contain vital supplies of useful substances: vitamins B1, B6, E, PP, minerals (calcium, potassium, magnesium, iron and a big number of others), organic acids, carotenoids and flavonoids. Cultivating the rosehip for over 7 years, we rely on the principles of eco-farming. The product is environmentally friendly. 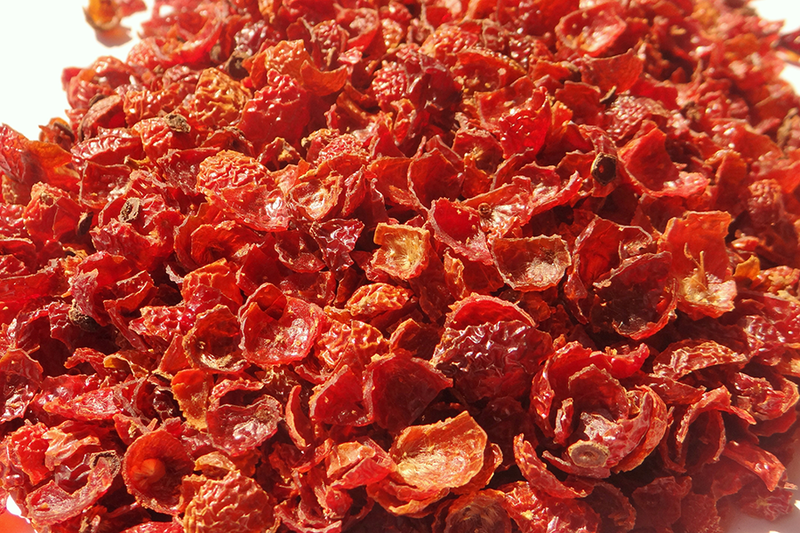 A special method of drying allows us to offer you the entire benefit of these berries, unique for its useful properties, which is confirmed by the natural rich pink – red color of the pulp. The pulp is cleared of stones and hairs. 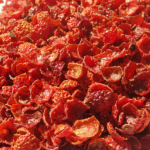 It can be used as fruit chips. In addition to the traditional brewing in tea (temperatures not higher than 60*C), our product can be used as additive to salads, cereals, pastries, etc., since the consumption of the pulp itself brings the greatest benefit to your body.